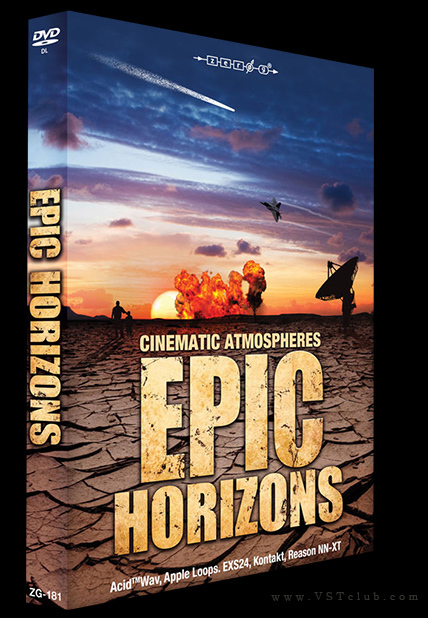 Epic Horizons is even bigger and better than Dark Skies. This magnificent download set from Zero-G delivers epic soundscapes, sonic narratives and audio vistas on a breathtaking scale. This colossal library contains over 850 instruments in EXS24, Kontakt and NN-XT format as well as standard Acidized Wav files and Apple Loops all recorded in stunning 24bit using state of the art sound design by one of the world's leading soundtrack and fx producers. There are also 30 construction kits that present a full musical/sound design piece which is then broken up into its constituent parts so that you can use them anyway you like. Adventure, sci-fi, thriller, horror, mystery, fantasy and action genres are all included in this vast library. In short, there is something for every big screen moment in this stupendous stockpile of sonic sensation!